Calcareous nannofossils - What are they? 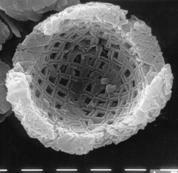 Calcareous nannofossils are tiny (micron-sized, i.e. 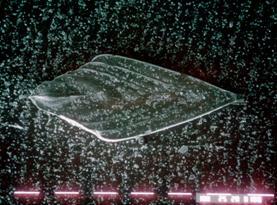 measured in thousandths of a millimetre) fossil calcite plates that formed the protective covering of marine phytoplanktonic (i.e. photosynthesising, floating) algae. With diatoms and dinoflagellates, they are, and were, the �grass� of the oceans, i.e. important primary producers at the base of the food web. 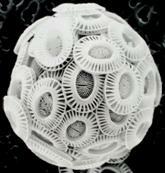 These algae are still living in the oceans today and the dominant group is called the coccolithophores. 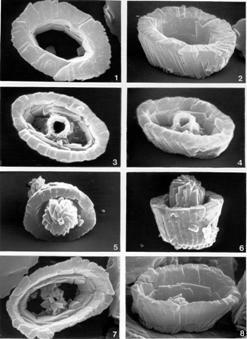 The fossil record contains many examples of coccolithophores (see Emiliania huxleyi and Watznaueria britannica, below), but also includes extinct types that may or may not have been closely related to the modern forms (see Schizosphaerella punctulata, below). As well as the inherent beauty of calcareous nannofossils, they are of great importance for a number of different reasons. Firstly, as oceanic primary producers, they play a key role in the marine ecosystem, and in marine biogeochemical cycles as producers of organic carbon, carbonate and dimethyl sulphide. Secondly, their calcareous skeletons are incorporated into seafloor sediments, providing a remarkably complete fossil record from the Late Triassic (225 Ma) to the present day. This fossil record provides an excellent way in which to determine the age of rocks, using biostratigraphy, but also gives an indication of the environments in which the rocks were formed, thus informing ocean and climate history, and reveals details of evolutionary patterns and processes. 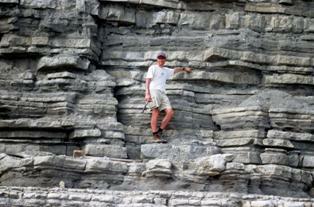 My research career has focused on three main themes of calcareous nannofossil science, namely: 1) the classification and evolution of fossil representatives; 2) stratigraphic and biostratigraphic applications; and 3) palaeoenvironmental/palaeoceanographic and palaeoclimate applications. My PhD research comprised one of the first comprehensive accounts of the early evolution and radiation of calcareous nannofossils (Upper Triassic-Lower Jurassic), and provided a thorough taxonomic account and preliminary phylogentic model for the initiation of Mesozoic diversification. 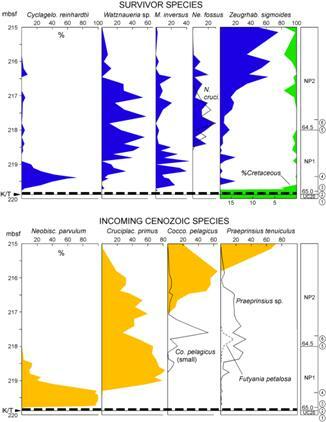 Building on this understanding of early diversification, I, in collaboration with colleagues, have produced taxonomic guides and phylogenetic models that incorporate Mesozoic, Cenozoic and extant nannoplankton. I have also published on the diversity history of calcareous nannofossils, and records for specific critical events, such as the Triassic/Jurassic and Cretaceous/Tertiary boundary intervals. 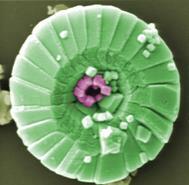 Other strands within this theme have included work on the ultrastructure, crystallography and biomineralisation of coccoliths, and the description of over 130 new species. Development of the V/R model, explaining the crystallographic architecture of coccoliths and their mode of intracellular growth, together with atomic forcing microscopy observations of coccolith crystals, represent significant steps in our understanding of these biogenic structures. Stratigraphic work during my PhD provided a new, refined biostratigraphic zonation scheme for the Lower Jurassic, which was then expanded to incorporate the entire Jurassic System. 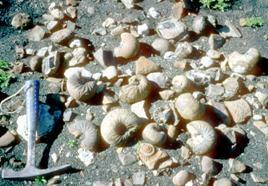 A pioneering stratigraphic study in southern Italy demonstrated the value of nannofossils in Lower Jurassic sequences lacking ammonites. Following on from this, biostratigraphic work was extended to encompass the Lower and Upper Cretaceous, and in 1998 a complete stratigraphic synthesis volume was compiled, representing a state-of-the-art nannofossil biostratigraphy handbook. The book contained new and revised biostratigraphic zonation schemes for all stratigraphic intervals, comments on zonal use, palaeobiogeography and evolution, and included over 2000 images representing much of the known nannofossil biodiversity. I have published biostratigraphic research from the entire geological history of nannofossils, as part of the Ocean Drilling Program, and other programs and expeditions. Calcareous nannoplankton are important contributors to modern global biogeochemical cycles and, as such, record and potentially drive environmental change. Like most plankton they are rather insensitive to environmental parameters, living as they do throughout much of the world ocean�s photic zone, and the challenge for nannopalaeontologists has been to unlock the key to their use as environmental proxies. I have supervised a number of students who have applied quantitative nannofossil assemblage data approaches to palaeoenvironmental studies in the Jurassic and Cretaceous (Dawn Windley, Ben Walsworth-Bell, Chris Street), and published studies addressing Early Cretaceous palaeobiogeography and Jurassic, mid-Maastrichtian, K/T boundary, and Miocene palaeoenvironments. Similar studies on mid-Cretaceous oceanic anoxic events, the Paleogene/Eocene thermal maximum and the Eocene/Oligocene boundary are in train (Tom Dunkley Jones). 2002���� Organising Committee member, 6th International Symposium on the Jurassic System, Sicily, Italy. Bown, P.R. 1998. Calcareous Nannofossil Biostratigraphy, British Micropalaeontological Society Publication Series, Chapman and Hall (Kluwer Academic Publishers): 1-315. Bown, P.R., Lees, J.A. & Young, J.R. 2004. Calcareous nannoplankton evolution and diversity. In: H. Thierstein & J.R. Young (eds.) Coccolithophores - From molecular processes to global impact, 481-508, Springer-Verlag. Bown, P.R. 1987. 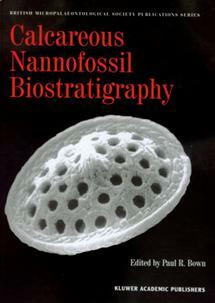 Taxonomy, biostratigraphy, and evolution of late Triassic-early Jurassic calcareous nannofossils. Special papers in Palaeontology, 38: 1-118. Bown, P.R., Cooper, M.K.E. and Lord, A.R. 1988. A calcareous nannofossil biozonation scheme for the early to mid Mesozoic. Newsletters on Stratigraphy, 20: 91-114. Bralower, T.J., Bown, P.R. & Siesser, W.G. 1991. Significance of Upper Triassic nannofossils from the Southern Hemisphere (ODP Leg 122, Wombat Plateau, NW Australia). Marine Micropaleontology, 17: 119-154. Baumgartner, P.O., Bown, P.R., Marcoux, J., Mutterlose, Kaminski, M., Haig, D. & McMinn, A. 1992. Early Cretaceous biogeographic and oceanographic synthesis of Leg 123: Sites 765 and 766 (Argo Abyssal Plain) and lower Exmouth Plateau). Ocean Drilling Program, Scientific Results, 123: 739-758. Young, J.R., Didymus, Bown, P.R., Prins, B. & Mann, S. 1992. Crystal assembly and phylogenetic evolution in heterococcoliths. Nature, 356: 516-518. Bown, P.R. 1992. Late Triassic-Early Jurassic Calcareous Nannofossils of the Queen Charlotte Islands, British Columbia, Journal of Micropalaeontology, 11: 177-188. Bown, P.R. 1993. 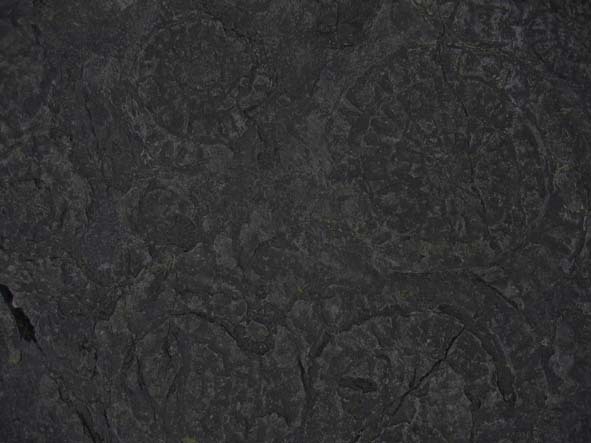 New holococcoliths from the Toarcian-Aalenian (Jurassic) of northern Germany. Senckenbergiana Lethaea, 73: 407-419. Young, J.R. & Bown, P.R. 1997. Higher classification of calcareous nannofossils. Journal of Nannoplankton Research, 19: 15-20. Bown, P.R. & Young, J.R. 1997. Mesozoic calcareous nannoplankton classification. Journal of Nannoplankton Research, 19: 21-36. Young, J.R. & Bown, P.R. 1997. Cenozoic calcareous nannoplankton classification. Journal of Nannoplankton Research, 19: 36-47. Young, J.R. et al. including Bown, P.R. 1997. Guidelines for coccolith and calcareous nannofossil terminology. Palaeontology, 40: 875-912. Young, J.R., Davis, S.A., Bown, P.R., & Mann, S. 1999. 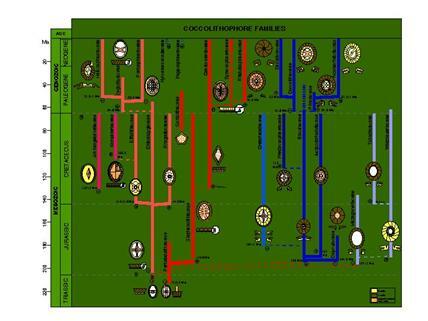 Coccolith ultrastructure and biomineralisation. Journal of Structural Biology, 126: 195-215. Street, C. & Bown, P.R. 2000. Palaeobiogeography of Early Cretaceous (Berriasian-Barremian) calcareous nannoplankton. Marine Micropaleontology, 39: 265-291. Henriksen, K., Young, J.R., Bown, P.R., & Stipp, S.L.S. 2004. Coccolith biominerlization studied with Atomic Force Microscopy. Palaeontology, 47: 725-743. Bown, P.R. & Concheyro, A. 2004. Lower Cretaceous nannoplankton from the Neuqu�n Basin, Argentina. Marine Micropalaeontology, 52: 51-84. Pearson, P., Nicholas, C.J., Singano, J., Bown, P.R., Coxall, H.K., van Dongen, B.E., Huber, B.T., Karega, A., Lees, J.A., Msaky, E., Pancost, R.D., Pearson, M. & Roberts, A.P. 2004. Paleogene and Cretaceous sediments cores from from the Kilwa and Lindi areas of coastal Tanzania: Tanzania Drilling Project Sites 1 to 5. Journal of African Earth Sciences, 39: 25-62. Lees, J.A., Bown, P.R. and Young, J.R. 2004. 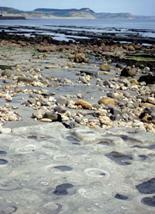 Evidence for annual records of phytoplankton productivity in the Kimmeridge Clay Formation coccolith stone bands (Upper Jurassic, Dorset, UK). Marine Micropaleontology, 52: 29-49. Robinson, S., Williams, T. & Bown, P.R. 2004. Fluctuations in biosiliceous production and generation of Early Cretaceous oceanic anoxic events in the Pacific Ocean (Shatsky Rise, ODP Leg 198). Paleoceanography, 19: PA4024, doi: 10.1029/2004PA001010, 2004. Frank, T., Thomas, D., Leckie, M., Arthur, M., Bown, P.R., Jones, K. & Lees, J.A. 2005. The Maastrichtian record from Shatsky Rise (northwest Pacific): a tropical perspective on global ecological and oceanographic changes. Paleoceanography, 20: PA1008, doi: 10.1029/2004PA001052, 2005. Bown, P.R. 2005. Paleogene calcareous nannofossils from the Kilwa and Lindi areas of coastal Tanzania: Tanzania Drilling Project Sites 1 to 10. Journal of Nannoplankton Research, 27: 21-95. Bown, P.R. 2005. 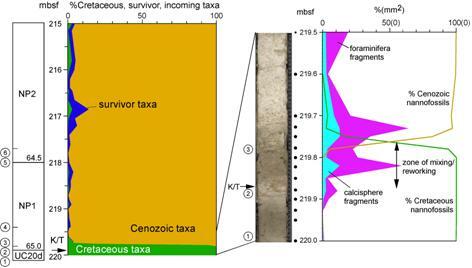 Selective calcareous nannoplankton survivorship at the Cretaceous-Tertiary boundary. Geology, 33/8: 653-656. Bown, P.R. In press. Early to mid-Cretaceous calcareous nannoplankton from the northwest Pacific Ocean (ODP Leg 198). In Bralower, T.J., Premoli Silva, I., and Malone, M.J. (Eds. ), Proceedings of the Ocean Drilling Program, Scientific Results, 198 [Online]. Available from World Wide Web: <http://www-odp.tamu.edu/ publications/198_SR/103/103.htm>. Bown, P.R. In press. Calcareous nannoplankton evolution: a tale of two oceans. Micropaleontology. A three- to four-week (35-40 lectures, 40 practicals) module taught as part of the Micropalaeontology MSc. The course is internationally unique in providing extensive postgraduate training in a fossil-extant group that is widely utilised in Earth Sciences and the hydrocarbon exploration industry. 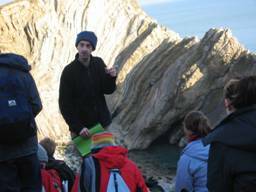 The course covers all aspects of the biology, palaeobiology and evolutionary/stratigraphic history of calcareous nannofossils. This half course-unit course (20 lectures, 8 practical classes) gives an account of the development of life on Earth and the way in which life and the physical environment have interacted through 3800 million years of Earth�s history. The course begins with the formation of the Solar System and goes on to discuss the origins and development of life and the planet through the Precambrian and Phanerozoic. The course includes introductions to all aspects of palaeontology - palaeobiology, biostratigraphy, evolution, palaeoecology and taxonomy - and practical classes cover the description and classification of major invertebrate fossil groups, and the manipulation and application of palaeontological data. In both courses, there is a common teaching philosophy, stressing the academic, economic, environmental and cultural impacts of palaeontology and palaeobiology. Economically and academically, palaeontology has been at the forefront of the development and refinement of the geological timescale, providing the underlying framework for all of our understanding of Earth history, and, practically, the chronology for economic deposits exploration. Living and fossil organisms are also fundamental in the tracking of global environmental change that has profoundly influenced the way in which we view Earth history, revealing both catastrophic (e.g. mass extinctions) and gradual (e.g. biotic response to greenhouse-icehouse climate mode transitions) change. Culturally, palaeontology provides a unique context for humans and society, with respect to the remaining life on Earth and the planet itself � a fact clearly evidenced by society�s continuing fascination with all aspects of past life on Earth and other planets, most obviously with dinosaurs but actually reaching across the diversity of life. �� Second/third year undergraduate field mapping course to the Cantabrian Cordillera, northern Spain, which precedes their 6-week independent mapping project. 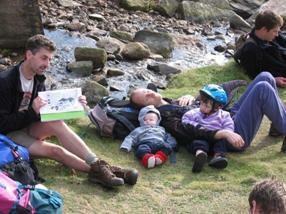 The area comprises a tectonised early Palaeozoic shallow marine succession.